Garmin's GPSMAP 1242xsv Touch is an excellent choice for boaters who want to step up to a big, bright 12” touchscreen, at a price far less than ever before. 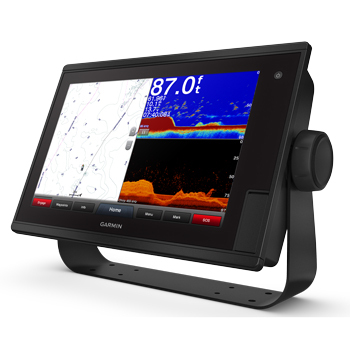 With it's built-in 1 kW single-channel CHIRP plus ClearVü and SideVü scanning sonars, it offers the most sought after features plus it’s compatible with Garmin Panoptix all-seeing transducers. Preloaded BlueChart g2 HD charts and LakeVU HD maps provide popular features such as Depth Range Shading and Shallow Water Shading. The 1242xsv Touch is NMEA 2000 compatible, allowing for communication of numerical date between sensors and other NMEA devices. Fully network capable, you can add radar or another display via simple Ethernet cable. It also supports FLIR cameras, GRID keypad, GXM53 marine weather receiver, FUSION-Link audio system, VIRB camera streaming and more. Network sharing allows you to share data along the network and it even has built-in Wifi to support Garmin's ActiveCaptain app. LakeVu HD provides highly detailed freshwater maps that include 17,000+ U.S. lakes, rivers and reservoirs. Included in those are more than 13,000 HD lakes with up to 1’ contours. Upgrade to LakeVu HD Ultra with Max Def Lakes to access the Auto Guidance feature, sonar imagery and more. BlueChart g2 covers the East Coast, West Coast, Gulf of Mexico, U.S. and the Canadian side of the Great Lakes. It includes basic coastal charts, tidal and current stations, depth contours, IALA nav symbols and fishing. For the ultimate navigation experience, purchase the optional Bluechart HD Vision card for your area, and get access to Satellite imagery, auto guidance and much more. The Garmin 1242xsv Touch supports the Garmin inReach Mini Satellite Communicator which allows users to select from a list of preset responses to communicate with friends and family directly from your chartplotter. 1KW Single channel CHIRP ClearVu and CHIRP SIdeVu. Garmin's GT21 8-Pin Transom Mount Transducer provides Traditional 600W (50/200kHz) Sonar and 500W ClearVu (CHIRP 260/455kHz)Built-In Temp sensor. 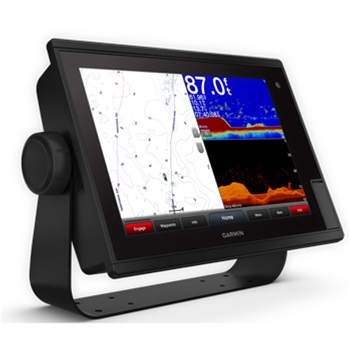 Garmin's GT23M-TM Mid-Band CHIRP Transom Mount Transducer provides depth and temperature readings. Perfect for Coastal or Offshore fishing the GT23M includes CHIRP ClearVu for near photolike images below your boat. Garmin GT51M-TM 12-Pin 600W CHIRP (Mid-Band CHIRP 80-160kHz) and 500W (CHIRP 260/455kHz) ClearVu/SideVu Transom Mount Transducer. Built-In Temperature Sensor. Compatible with Garmin GPSMAP 7600xsv Series and GSD25. Garmin GT40-TM 12-Pin Traditional 500W (77/200kHz) and 500W ClearVu/SideVu Transom Mount Transducer. Built-In Temperature Sensor. Compatible with Garmin echoMap 73sv, echoMAP CHIRP sv Models, GPSMAP 7600xsv Series, GSD25. Garmin GT51M-THP 12-Pin 600W CHIRP (Mid-Band CHIRP 80-160kHz) and 500W (CHIRP 260/455kHz) ClearVu/SideVu Thru-Hull Transducer Pair. Built-In Temperature Sensor. Compatible with Garmin GPSMAP 7600xsv Series and GSD25. Designed for boats with a 5 - 25 degree deadrise. The Garmin GMR 2524 xHD2 25kw 4ft Open Array Radar features a 8 bit true color display and Pulse Expansion mode which maximizes the amount of energy on a target resulting in larger targets on your Chartplotter. With an improved 96nm range tracking land, weather and other boats is a breeze. Garmin’s GMR 2526 xHD2 Radar with 6’ Open Array Antenna and 25kW of power provide an expanded maximum range of 96nm. 8-Bit True Color Display, Pulse Expansion, Auto Bird Gain, Echo Trails and Much More. Perfect for serious anglers and long-distance cruisers. The Garmin GMR 404 xHD Digital 4' Open-Array Radar has 4kw of output power and a maximum range of 72 nautical miles. It can also scan in dual range for better situation awareness. See storms, boats, buoys, land and birds in the dark or in the fog. Garmin's GT41-TH Thru-Hull Transducer provides traditional sonar along with crisp, clear photo-like images below and to the sides of your boat. 600W Traditional Sonar with operating frequencies of 50/200 and 500W per element (1,500W Total) CHIRP ClearVu and SideVu with operating frequencies of CHIRP 260/455 kHz. Built-In Fast Response Temp Sensor. Designed for Boats with Less than a 5 Degree Deadrise. Garmin's GT41-TM Thru-Hull Transducer Pair provides traditional sonar along with crisp, clear photo-like images below and to the sides of your boat. 600W Traditional Sonar with operating frequencies of 50/200 and 500W per element (1,500W Total) CHIRP ClearVu and SideVu with operating frequencies of CHIRP 260/455 kHz. Built-In Fast Response Temp Sensor. Designed for Boats with a deadrise over 5 degrees. Garmin GT50M-TM 12-Pin 300W CHIRP (Mid-Band CHIRP 80-160kHz) and 500W (CHIRP 455/800kHz) ClearVu/SideVu Plastic Transom Transducer with built-in Temperature Sensor. Compatible with Garmin GPSMAP 7600xsv Series, GSD25. 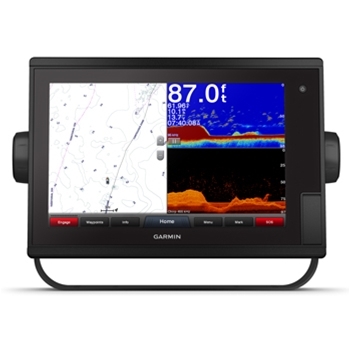 Garmin’s 1242 Chartplotter offers a 12” touchscreen display. Fully networkable, this unit comes preloaded with Bluechart G2 for the coastal waters as well as LakeVu HD for detailed lake mapping.